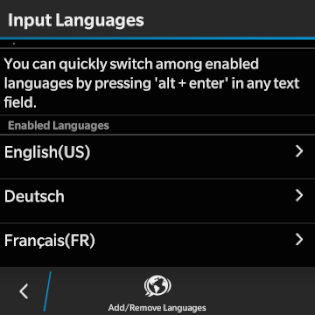 This is one of the little things that make typing on a BlackBerry so efficient. You can switch your input languages, but you don't have to. 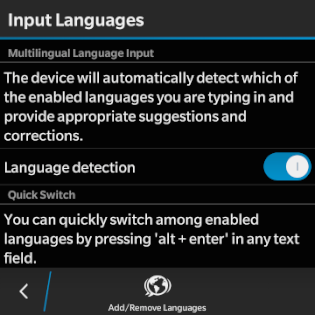 Your BlackBerry will detect the language you are typing in and make proper suggestions. And it does so by the sentence. Multiple languages in the same message and no need to adjust anything. Not a problem if you only ever type in one language, but a real time saver for me. I Hope to See this Feature in iOS (written with German input language). I can only second Thomas Lang's comment. The annoyance of the language switch is one of the main downsides to iOS, day after day after day. Yes! Darn word had it years ago, iOS is crazy multilingual-unfriendly. Erm, and Windows (10, any Formfactor) as well ;) Would love to see it there. Giving an app full access to everything is not iOS thinking. What’s more, giving an app full access to everything is not *my* thinking, either. As unfortunate as that might be. That's why I love my Blackberry 10 Devices... - since I have to write in 2 languages on and off constantly as I am sure so many of us need, you would think that in today's global business environment, such thing is common sense. Same as Markus Heyl, and it's one of the reasons I would absolutely hate to see BB 10 die as a platform. Works perfectly fine with Swiftkey, which I believe is now free on multiple platforms. I don't have first hand comparisons available, but the word prediction of Swiftkey in general has been lauded as one of the better ones, if I remember correctly. Swiftkey haben wir schon durch. Die Frage ist, will man einer App vollen Zugriff auf alles geben? Für mich heißt die Antwort nein. Next to German and English we also do need Japanese. Blackberry in former days was a nightmare as not "all" languages were available in all build. Android still is equally annoying (different keyboard needed). Here Apple is the favorite as the switch between languages is easier. The issue with automatic language detection remains. On the stock Android keyboard I need one tap on the keyboard to switch between two input languages (may be more if you need 3+ languages). Admittedly not as good as automatic language detection, but I don't see where the problem of one quick tap to switch input language is? Bernd, that was true for the old BlackBerrys but not for BB10. Armin, you are much smarter than I am. I often forget to switch the language before I start typing. Only when I see all the wrong AutoCorrect words, I have to go back, delete them and start all over. Certainly more than one tap. @Armin: This does not work with Japanese and some other languages. You have to install a separate keyboard app (e.g. "Google Japanese Input" or Simeji) and then no more one-tap between languages in Android is possible. In this case iOS leads. 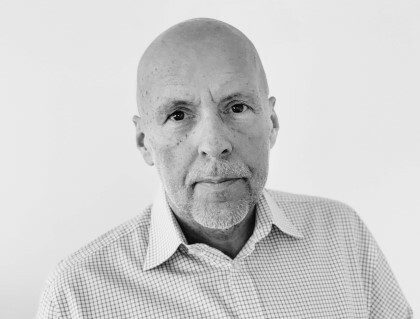 @Volker: Never had a chance to look at BB10 as we still use the "old" ones at the company. Uh, in my Android (Samsung S3, on factory image. Cyanogenmod being contemplated) I just swipe across the space bar (which displays the current language). Also, suggestions are from all enabled languages. I know Android. I know BlackBerry. I know iPhone. I know Windows Phone. And I know a bunch of others. BlackBerry gets this right. Everybody else is second.